CRU contributed three of the canonical proxies – Tornetrask, Taimyr and most importantly, Yamal. Yamal was very much in the news when Climategate broke. In my submissions, I identified Yamal as an important issue. Needless to say, it’s been ignored. I’m going to re-visit the inconsistency issue today – I’ve collected information from a number of sites in the general Yamal area on the Hantemirov and Shiyatov location map below (Polar Urals and Nadim are from slightly outside the four corners of the location map. Figure 1. Inset chronologies on H-S location map. For the purposes of this map, I’ve done the chronologies by making a age-curve from the entire population of subfossil cores in the Climategate documents and developing a chronology for each site from the residuals for this standard fit (taking one size fits all to a regional scale). Red – slarch; green – spruce. The original Yamal chronology (modern portion) is also shown. The statistical problem is, of course, the inconsistency between the decline observed in the majority of northern tree ring proxies and the extreme HS-ness of Briffa’s Yamal chronology, especially after it’s been Mann-smoothed or Kaufman-smoothed. In typical small subset multiproxy studies, it ends up making a disproportionate contribution to the overall HS-ness of the reconstruction – an effect that we observed last fall with Kaufman et al 2009, for example. 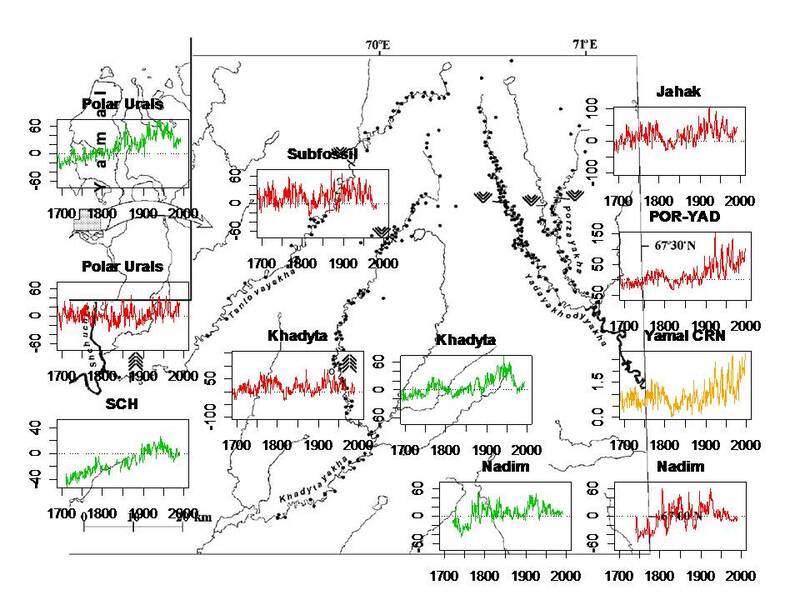 The controversy last fall arose over the very small population of cores in the Briffa 2000/Briffa 2008 Yamal reconstruction together with an inconsistent pattern in a nearby Schweingruber site (Khadyta River) which showed the characteristic decline. The Climategate documents contain new and relevant information on the Yamal samples. The file briffa-treering-external/ecat/yamal/sfw-list provides the location of many samples, showing that many subfossil samples came from the Khadyta River ( a point confirmed by the location map in Hantemirov and Shiyatov 2002.) The idea (promoted by Gavin Schmidt and others) that the Khadyta River site was somehow inappropriate was not argued by Briffa himself. So what is the “best” indication of relative ring-width changes in this Yamal region? One approach is to judge this by making use of all the data to hand. Briffa’s concept of “all the data to hand” is remarkably constricted. There are a number of other chronologies in the region besides the ones mentioned in Briffa’s response. These include a Khadyta spruce chronology, larch and spruce chronologies at Polar Urals, a spruce chronology at Shchunya River, larch and spruce chronologies at Nadim River and Kheygi River (to the southeast). It is obvious from a simple inspection that the “decline” also affects Yamal chronologies – the elevated growth of the POR-YAD sites in the late 20th century contrasts sharply with the late 20th century decline characteristic of other sites, especially the spruce chronologies. Briffa is obviously not unaware of the “divergence” problem, but the problem is not addressed in either of his journal articles discussing Yamal or in his internet article – the latter is unfortunately preoccupied with trying to “get” the same answer as before, as opposed to reflecting on the more general problem. This inconsistency is an important statistical issue for users of the Yamal chronology – which include most multiproxy reconstructions. It does seem odd that these few trees, like Graybill’s stripbark bristlecones, are have a unique ability to act as hemispheric thermometers. They deserve to be recognized by UNESCO as sacred groves. It’s too bad that Oxburgh didn’t include that as one of his recommendations. This entry was written by Stephen McIntyre, posted on Apr 25, 2010 at 3:19 PM, filed under Uncategorized, Yamal and Urals and tagged khadyta, Yamal. Bookmark the permalink. Follow any comments here with the RSS feed for this post. Both comments and trackbacks are currently closed. Of the sites highlighted, only POR-YAD and Yamal-CRN display a non-decline characteristic. The natural conclusion is that there is something different going on at these sites compared to the rest. Until that is explained, those two are suspect. It seems that some people do understand that tree ring growth is a non-linear function of temperature plus other variables, while others are accepting that tree ring growth is a linear measure of temperature. Of course the recent decline and the flat MWP are both due to the real non-linearity, so rejecting data for one ought to imply rejecting it for the other. From my experience with non-linear mutivariate analysis I would say that it is quite feasible to extract multiple different variables from the data if multiple different sites are included where some are more sensitive to rainfall, some to temperature, some a little wetter / drier and some a little hotter / colder on average. By this means I think that it is very likely possible to extract both global temperature and global (or regional) rainfall from tree ring proxies by the use of multiple sites and some overlapping in time of real temperature and rainfall figures for some regions. I am happy to be contacted on this and do some analysis of data if it is supplied to me. While you may be right that it is possible, to use this information to project past temperatures, one would have to have data on precipitation for pre-instrumental times (like 1700AD) so that one could subtract it out. Even then the nonlinearity produces non-unique temps from ring width–the same width could indicate colder than optimal or warmer than optimal conditions in the past. Even Fritts was aware of this way back in 1976 in his text book and advised caution when using rings very far back in time. Re: Ray Tomes (Apr 25 16:09), the actual multivariate methods in play are mind-blowing. If you have the skill and the time, please do. Steve has archived a large chunk of the data here. Mann’s fundamental method of determining a “good proxy” is to weight things based on correlation with the available temperature records. But the number of safeties removed is alarming. It is fundamentally a best-match-finding method. The issue with divergence is the sheer number of “good proxies” that don’t manage to remain good proxies as time marches forward. If I am remembering correctly, every one of the “top proxies” has had resampling since the original MBH1998 – and that resampling has been odd enough that I don’t think the same sites would rank near the top using the identical methods of MBH1998 with the updated proxies. Which should be a clue that one hasn’t actually found a method to weed “good proxies” from the sea of existing proxies. Thanks Craig and Alan for your comments. I have had the experience more than once of “accidentally” finding two independent factors when analyzing a lot of economic data, that when plotted were in a horse-shoe shape. A single factor would suffice if a non-linear basis was used. It may be that similar things will apply for temperature, it may be that they will not. But it is well worth a try. Please don’t give them any new ideas for their recommendations. Doesn’t the fact/observation that the subfossil sites appear to be north of the present treeline indicate that the climate in this region has got colder, rather than warmer? I have always preferred treelines to treerings for temperature reconstructions, but are we looking at the same timescale? Southward marching treelines are a pretty obvious thing to attempt to ignore. But they are only one in a list of fairly obvious problems that get glossed over when trying to find a rather small signal in a lot of noise. Of course the Russians researched the treeline changes. In the Hantemirov’s thesis abstract he wrote that the most northern line was attained 9400 – 7400 years ago and it was 400 km up to the recent one.Then it moved down and remained 50-70 km north from the contemporary treeline (during 7400 – 3700 BP) And since 3700 BP it is at the most southern position detected. Doesn’t the fact/observation that the subfossil sites appear to be north of the present treeline indicate that the climate has got colder, rather than warmer? I have always preferred treline to treerings when it comes to temperature reconstructions, but are we in the same timescale here? This is just a stupid question from a noob – but why are samples (the dots) from chronologies grouped by (long) rivers? I understand that the narrative it is to characterize similar hydrologies with the assumption that entire rivers behave similarly. But seems to me that water in a river is irrelevant to a tree in that watershed, and watersheds aren’t necessarily uniform. Would seem to me that a tree might be influenced by the temperature of the groundwater available for use. Not what’s in a river. And that might be driven by say perhaps average ground temperature (which may / may not be a proxy for air temp)? And might more faithfully be recorded by latitude (irrespective of watershed)? I’m sure smarter people than I have addressed already, sorry if off-topic. Snip away. If I remember correctly, the trees grow better in the river valleys, being too small to sample outside them and taking on a shrubby growth form (this is near arctic treeline). In addition, for trees to be subfossil they must have been buried in muck, which happens by the river. The trees grow only in the river valleys, on the floodplain. They grow only for some 4 summer weeks per year and even that sometimes with sudden frosts. The river has here a function of a central heating. It’s a very peculiar niche. About the half-fossilized trees – Hantemirov wrote that these are found not only in the area of recent forests, but also tens and hundreds kilometers to the north of the present treeline and were found in the bogs. Those found in the recent forest area were “felled” by erosion of the river banks and fossilized in the alluvial material. From your fantastic plot, it looks like a gridded reconstruction may be appropriate for the region. Any way to aggregate these charts in appropriate geographic context, by latitudes as well as by terrain features such as elevation and rivers, without using overlays or rarified statistical techniques? A CA interpretative summary/conclusion would do much to clarify “divergence” issues as a whole. When do we reach the point of realising that one does not make a silk purse from a sow’s ear? To mix metaphors, if more eggs were added to Briffa’s pudding, maybe this would yield silk? Would those who contributed speculative comments to the previous thread “Yamal and the Vaganov Network” like to reconsider them in the light of this thread? I did it, but I think I got away with it, as Basil Fawlty once said. I’m puzzled by your comment because it cuts through a whole lot of previous comment. Are you new to this topic or have you a lot more experience than is shown on CA? Sure you can cut clusters of data out of the herd by multivariate analysis, but it’s a much more difficult task to assign specific, quantitative growth mechanisms to them. I am not a climate scientist. I am a cycles researcher with considerable statistical experience. In my experience interpolation works a lot better than extrapolation. That is why IPCC is in so much trouble. What I really want is someone to give me a link where there are a decent set of tree ring chronologies from around the world and hopefully some corresponding climate records overlapping them for the last century or so. If there is sufficient diversity in the nature of the regions then I think it may be possible to extract some sort of global temperature from the data at least. I am working on the assumption that different tree types and different regions will have different shaped non-linear responses to temperature. Thank you for the excellent graphic. Tree rings are not reliable proxies for bygone temperature? Not without other corroborating evidence, such as precipitation records, cloud cover records, etc. And if you had all that, you’d most likely have temp as well, making the need for proxies moot. Re the Sacred Grove comment: It is unusual to see you degenerate into high sarcasm, Steve. I have a keen appreciation for a well-crafted barb, and do not mean any criticism at all in noting the zinger. It certainly seems called for, and I have often wondered at your steely resolve in taking the high road in the face of the derision, ad hominem and baseless accusations that have come back at you. I have also wondered at how rarely this point is highlighted by skeptics. If I was in your place I think it would be the first, and loudest, point on which I would labour. Even if one grants, for the sake of argument, that the selection and analysis of these proxies are appropriate, and that they are unpolluted, unimpeachable proxies for average temperature, it strikes me that their limited geographical scope and the rather specialized subclimate conditions within which this sample was created render any conclusion from them about hemispherical, or global, climate time series, next to useless, in isolation. The fact that so many proxy chronologies, especially among those used to support hockey-stick outcomes, draw on data from this same tiny region, speaks volumes about the validity of any generalization — before one even considers the integrity of the analysis or its interpretation. It is tempting to also speculate about the motivations behind such narrow selection (but I won’t go there, as I know you frown on that). I revised the graphic to fix a mistake in how implemented a very rigid age curve. The chronologies are expressed in residuals rather than the usual ratios – which are conventional in but hard to use with standard statistical tools. I have some methods that emulate this, but didn’t use them here. I added in the Nadim larch chronology as well. A feature that emerges more clearly in the revised graphic is a very long term increase in spruce ring widths up to the decline. steve- is there a word missing from this sentence? which are conventional in xxxxx, but hard to use with standard statistical tools. which are conventional in, but hard to use with, standard statistical tools. which are conventional with standard statistical tools. which are hard to use with standard statistical tools. These charts are nothing more than noise. Some going up, some going down, some flat. All this, over a very limited geographical area. I wonder at how anybody would even attempt to draw ANY sort of reliable conclusion as to what they mean. More importantly, how anyone could then pretend that tree ring chronologies can provide a meaningful paleoclimate reconstruction is nothing short of breathtaking. While of itself this does nothing to prove or disprove the theory of AGW, it does highlight how immature (I mean literally) this debate is. Our policy makers would do well to take note. LearDog – I think rivers may provide an easy access route. Anybody know for sure? The main problem is, that the Briffa´s picked proxy does not correspond with actual Yamal temperature record. The green “all in” mix is not that bad. Jeff Id (#7) used just a few words to more elegantly express that which I was driving at: there may be another way to group trees for analysis. I understand the access issue for collection of the data, wondered why they’re not grouped “latitudinally” for subsequent analysis. In other words – gridded. Thanks Jeff ! Ha ha ha! Not being locked in to a dogma, I work on lots of topics. Sometimes, when I explore a topic I conclude that the data do not allow conclusions to be drawn or that a certain method yields ambiguous results. For example in one of my first pubs I showed that theoretically a grazing system could exhibit a cusp catastrophe dynamic, or even the butterfly catastrophe (a manifold in equilibrium space, not a “catastrophe”), but that the data were too noisy and the system too stochastic for one to ever detect this behavior in the field. What I do (and did) under these circumstances is say so in my paper about it, and then drop that type of data or analysis as not promising for further work. To keep digging where you have found only fools gold seems…well, not clever. IIRC, the emphasis is on the rivers because past meanders plus floods have left much fallen and preserved timber next to the rivers in shallow alluvium. On reflection, I think I have the answer. The tree line is receding from east to west and the temperature is also increasing in this way. I have often wondered why people equate temperature gradient to latitude, to the exclusion of lateral thinking longitudinally. Some of these more technical articles are a bit “inside baseball.” You should see if there is a volunteer who would like to popularize them for you a little bit. Either that, or update the “update the proxies” post so that people know where to go to get an orientation to understand why you discuss these topics and what the implications would be if you are right. Contrary to a myth believed in by the climate science “community”, most recent multiproxy reconstructions are not “independent” – they merely recycle the same stereotypes with slightly different weighting methods. If there’s an in-depth treatment of the general issue of (lack of) independence of reconstructions that anyone could recommend, I’d be most grateful. Must read. Archaelogists found weapons and tools under the ice from thousands of years ago. Does this mean, it was warmer in the north at one time? It means it was at least warmer before the little ice age of the 1500s-1800. Once ice builds up it can take a while to melt and thus does not say precisely how much warmer or when. The general picture however is one of higher and more northerly treelines at the MWP. Craig, to be precise the discovery only tells us that the glacial ice was not present at the time the artifacts were deposited. Since that time the glacier advanced and retreated. If one knows that precipitation remained constant then one can infer past temperature. If the precipitation history is unknown, then you can’t break temperature out of the equation. OT, sorry, EW you might be the person to ask: Why did Otzi the 5,200 year old iceman (recently discovered in the Alps) not appear and decay during the MWP? Of course, the real question is how he ended up under a glacier in the first place. How did he go from walking around alive to being dead under a glacier? Did the corpse burrow under the ice? Because glacier retreat and advance has more to do with precipitation than minor changes in ambient air temperature. A better question is how many Otzis did appear and rot in the MWP because there weren’t any archaelogists around to find them and preserve them :). I am reminded of the wise adage, the Ns justify the means. The more trees from an area, the more reliable their average would be. Scientists seeking honest, representative results would want to incorporate and combine all tree results. Not true for dendros. In this field scientists are dealing with very noisy data sources so they look for reasons to exclude some of their data (usually the stuff that does not give them the desired results). The entire debate between dendros and SteveMC comes down to the legitimacy of the proxy selection techniques. So is McIntyre on the side of less data or more? If on the side of more, he is on the side of the adage. Let’s harken back to Sept. 27, 2009 for this oldie from the past: Yamal: A “Divergence” problem. Compliments the above discussion. I’m still trying to find the local weather station for this area, believe it may be Salekhard. Would like to see how the local instrumented data compares with the tree rings. Of course, the team could have used Tashkent or Sapporo for the local weather station for I know (joke). Another consideration is that the Soviets started exploration for natural gas in the area in the 1960’s. And some of the worlds largest natural gas fields were discovered in the Yamal-Naidym region in the ’60s and ’70s. It would be interesting to look into possible environmental impacts from these efforts on Professor Briffa’s trees. Point is: they’re running with the assumption that these Unesco trees are untainted. To my mind – it should be proved that they aren’t unique. 2. On the “divergence problem:” In an email to me about 6 weeks ago, Osborn CRU fame told me that the famous “fudge factor” program in the Climategate files was part of a project that he had in relation to the divergence, which project involved fitting data to parabolas. I diagnose that to mean that the world renowned experts at the CRU have just discovered that tree growth responds to variables other than temperature – be that local temperature or regional temperature by “teleconnection.” On that subject, the “teleconnection” thing (Mann) reminds me of quantum entanglement. I didn’t think they were up to quantum mechanics. The “teleconnection” postulate of the Hockey Team is totally without scientific foundation, since it implies some sort of mysterious action-at-a-distance. The locality priciple of physics (from Einstein’s special relativity) is basically that any event in spacetime depends only on collocated events. At any instant, a tree is only affected by the temperature at its location. Analogously (for illustrative purposes), there is no “teleconnection” of soil moisture content. In that regard, a tree’s growth is only influenced by what its roots can touch. As suggested by Mr. Murphy, some micro properties (e.g. spins of electron pairs) appear to defy locality, but I doubt that there is any evidence that a macro-property like tree-growth is subject to the phenomenon of quantum entanglement. Trees can give us a great indicator of climate change. I’ve heard of studies being done that study various aspects of tree ring growth and the changes in our climate over time.